Batteries and Chargers Part II: Is Bigger Better? 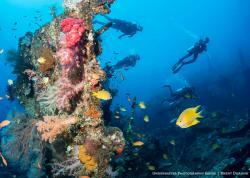 Rechargeable batteries are the mainstay of underwater photography. Your camera needs them, your strobes need them, your focus light needs them and your dive lights need them too. Rechargeable batteries come in both proprietary and standard formats. Proprietary batteries are like those in your camera or in some strobes. 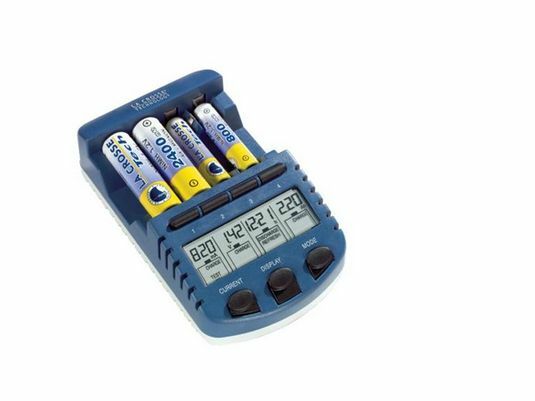 This review discusses the more common rechargeable AA batteries which are used in many devices. In order to test the batteries under controlled conditions, we used a computer controlled test system. The system shown below connects to a PC through a USB cable and is completely software controlled. 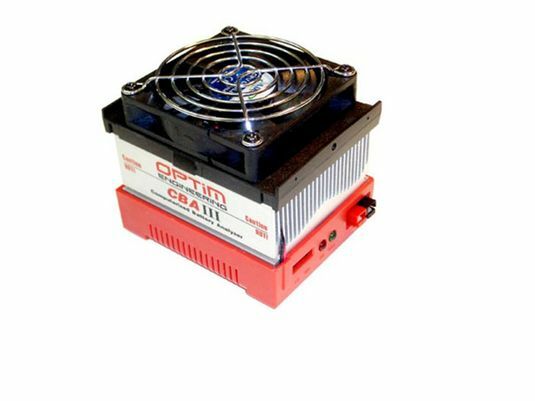 In order to completely control the battery testing and in particular to control both voltage drop in the wiring and contact resistance issues, we also constructed a custom battery holder using metal contacts and 12 gauge wire. We calibrated the computer controlled system with an Agilent E3610A constant current power supply and verified that the test system was accurate to within +/- 3% at 1 V and 1 A and +/- 2.5% at 1V and 3A. The test system can be run in several modes; for the purposes of this testing we used a constant current mode and pulse mode. All testing except the very low current testing was performed on 4 batteries of each type and the data from all 4 were averaged. 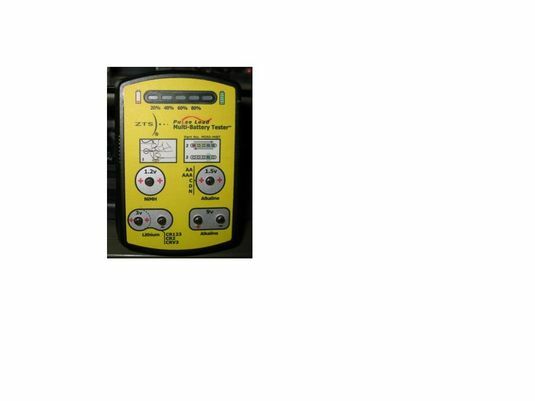 Outside of the laboratory, on a dive boat for example the battery tester we recommend is the ZTS Pulse Load tester shown here(first image below) and available from Ultralight Control Systems. As important as the test systems are, the batteries need to be charged in a controlled manner as well. We recommend the LaCrosse charger(second image below) and all batteries were run through the refresh cycle before testing. ZTS Pulse Load Tester shown above. La Crosse battery charger shown above. The first test we ran was a simple low current check to verify the labeled battery capacity. For this test we set the current at 0.05 Amps. At this current we expect to see that all batteries can perform to their label claim. One issue with this test is that it takes an exceedingly long time to run. 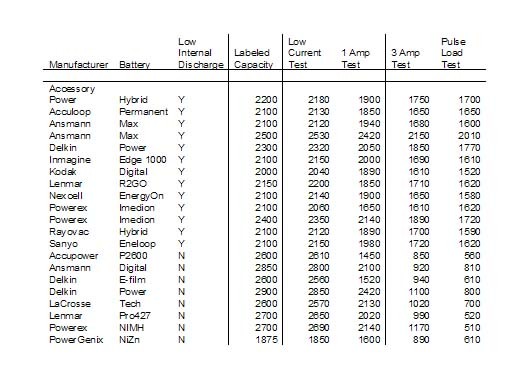 If a battery is labeled at 2700 mAh (milliamp hours) and the test is run at 50 mA it takes 50 hours or a bit more than 2 days to run. That is why we only ran one of each battery for this test. The test is run until the battery voltage drops below 0.9 V, a value that we set arbitrarily but which is consistent with the low battery alarm on many devices. In this typical experiment, fully charged batteries start out at bout 1.44 V or so and rapidly decline to about 1.2 V which is the nominal operating voltage of NiMH cells. Near the end of their life, they decay quite quickly form 1.1 V to 0.9 V which is the cutoff that we have chosen for these series of tests. Note that this single battery test takes a bit more than 2 days to run. The data from the 50 mA test is shown below graphically and at the end of the article in a table. The graph below shows the labeled capacity of the batteries on the horizontal X axis and the measured (single run) value on the vertical Y axis. 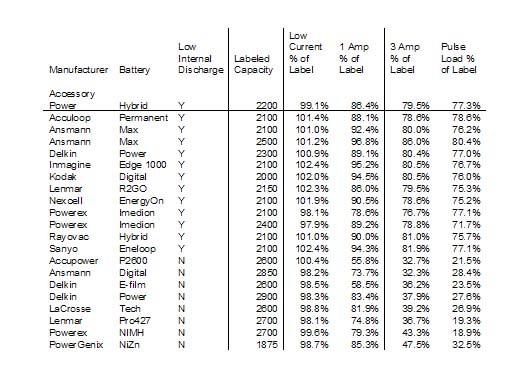 The diagonal line is the 100% of label capacity measurements should fall and notice that in the low current testing, all of the batteries are within a few % of the label claim. Unfortunately, in the real world most devices use more than a 50mA current draw. Some devices like the video monitors for underwater video use only a few hundred mA so batteries in these devices can last a long time but most things like strobes and underwater focus lights use much more current. 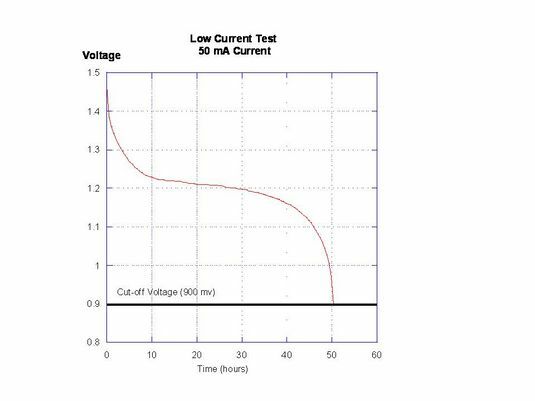 In order to evaluate how much current, we measured the current draw from a FIX 500 LED light and from this value we ran a second series of experiments at 1A power or 20x that of the low power test. The results were much more interesting and shown below. 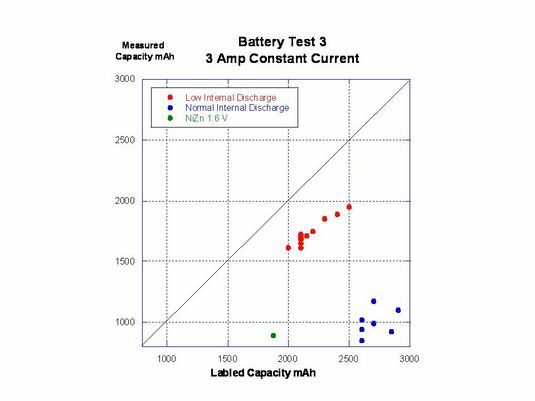 Unlike the low-power testing, in the 1A test, there is a significant difference between the low internal discharge batteries shown in red and the normal internal discharge batteries shown in blue. 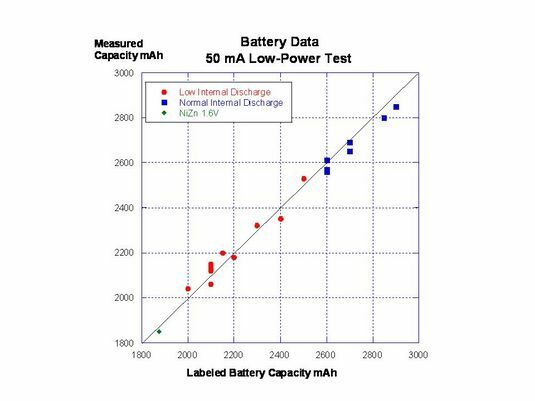 The NiZn batteries shown in green appear to be closer in behavior to the low internal discharge batteries than the normal ones. If you have modest current requirements it should be noted that at 1A current, the Delkin 2900 mAh batteries last slightly longer than the best of the low internal discharge units. In our evaluation of dive lights we were able to measure current draws that approximate 3A per battery (4 batteries, 1 hour burn time) so we also tested all of the batteries at 3A constant current. The data are shown below. 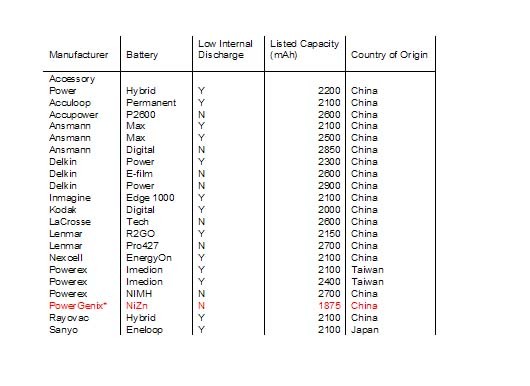 As noted in the above data, all of the normal discharge batteries have significantly lower capacities than any of the low internal discharge batteries. The Powergenix NiZn batteries behave between the two other types. Underwater strobes are one of the most popular uses for rechargeable batteries. Strobes don’t work with continuous output, but rather work in pulses. You charge the strobe, then find the critter then shoot it. When the strobe fires it then recharges and during recharge a strobe can draw considerable power. To test the batteries for use in strobes, we used a program where the batteries were tested at 4 amps for 5 seconds then let rest for 15 seconds. This cycle was repeated until the battery voltage was reduced to 900 mV. A typical run is shown below. 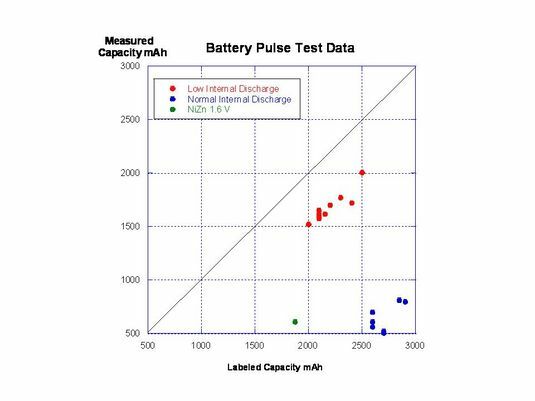 As seen in the data, there is some significant hysteresis when the batteries switch to 0 current and that the total discharge appears to follow the actual constant current discharge. 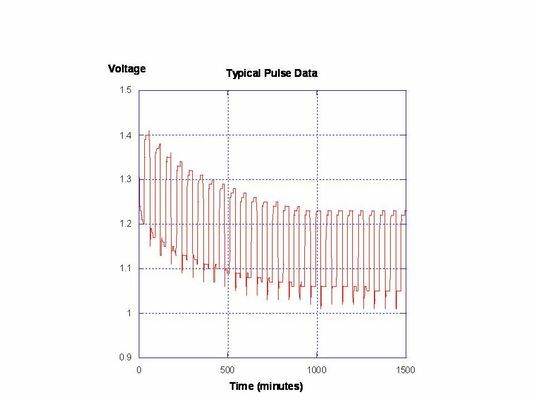 The battery data for the pulse experiment is shown below. As seen here, the distinction between the low and normal internal discharge is quite striking. 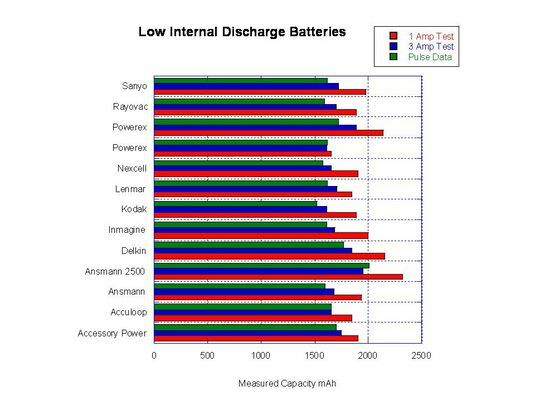 The data for the low internal discharge batteries is shown below. If you have a low power device, get the largest battery you can find like the Delkin 2900 mAh since in that application, bigger is indeed better. If you have higher power needs or use strobes that have high current needs during charging (like the YS-110a or DS-160) then get low internal discharge batteries like the Eneloop or Ansmann type. 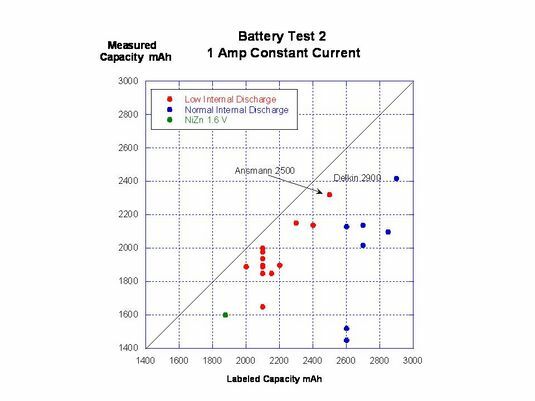 Low internal discharge batteries are constantly improving so keep your eye out for higher capacity models. Acknowledgement: We would like to thank the Medtronic Technical Fellows for technical and financial support. 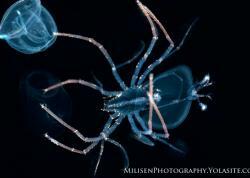 Bill Van Antwerp shoots underwater as well as topside photos. He is currently shooting a Canon 7D in a Nauticam housing. 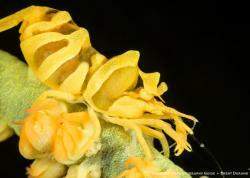 He uses a variety of strobes with his favorite being the Inon ring flash for macro photography. He is the techincal advisor for Bluewater Photo. Submitted by Anonymous on Tue, 2011-06-21 12:19. "Can eneloop be used in underwater light? firing source like sparks, it might cause bursting or fire." Could anyone comment these? Has anyone seen such a case? Do other LSD and normal NiMh accu have the same trouble?